A Financial Aid Administrator helps students in achieving their educational potential by providing them with monetary resources and awards. 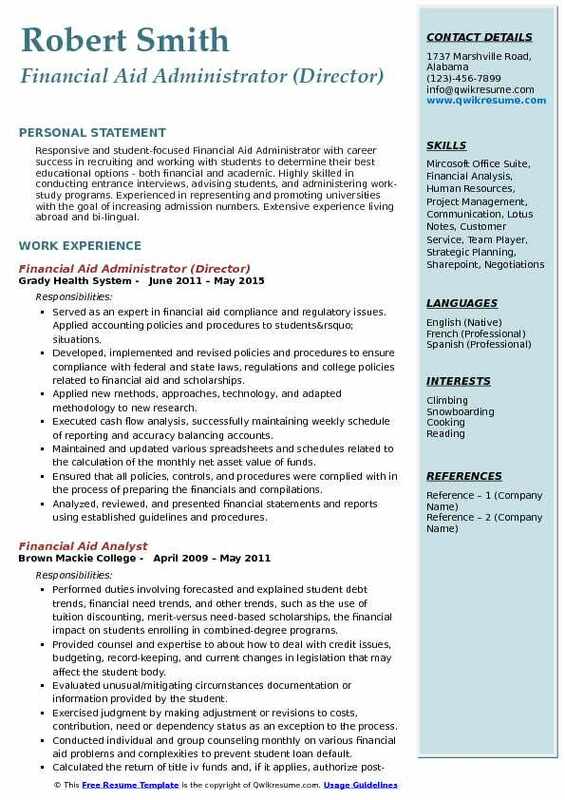 A well-crafted Financial Aid Administrator Resume makes mention of these duties and tasks – analyzing and evaluating the financial viability of the student, assessing the eligibility criteria, reviewing the accuracy of application, conducting interviews, overseeing collections and management activity, providing academic advisement, and performing miscellaneous job-related tasks as required. 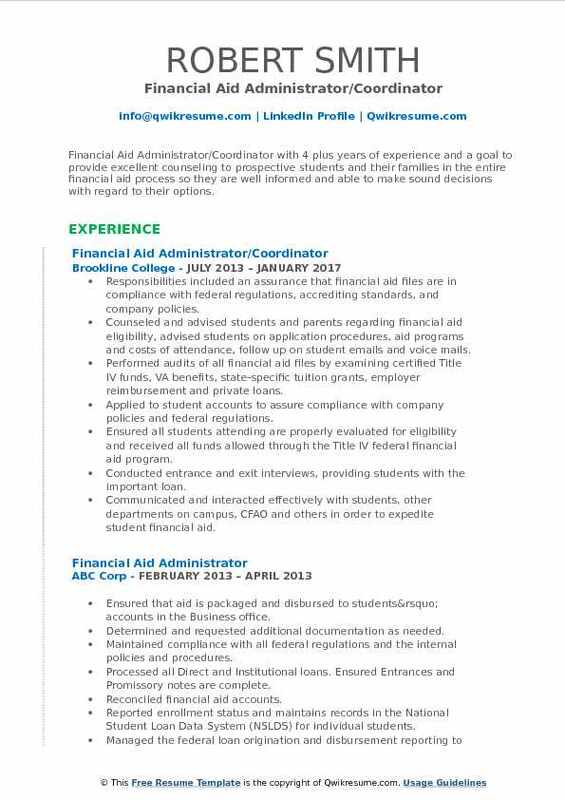 The knowledge, skills,and abilities required for this role include –a thorough knowledge of relevant software, a solid grasp over eligibility rules and norms, the potential to make evaluative judgment, knowledge of federal and state laws and regulations; a good understanding of financial aid policies and eligibility requirements, and strong communication skills. While a high school diploma and direct work experience are the specified requirements, completion of a Bachelor’s degree in Accounting or Finance is also considered as an alternative qualification. 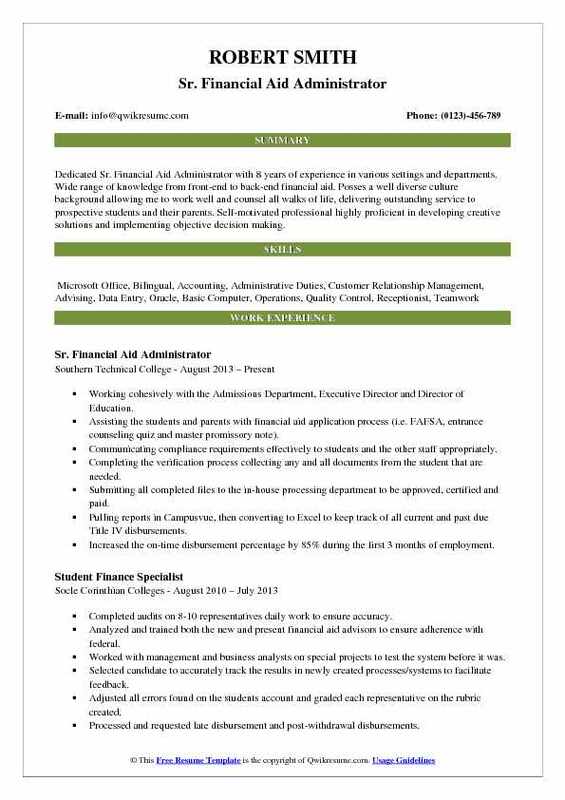 Objective : Junior Financial Aid Administrator offering versatile office management skills and proficiency in Microsoft Office programs. Strong planner, and problem solver who readily adapts to change and fast-paced environments, works independently and exceeds expectations. Able to multitask and prioritize in order to meet deadlines without compromising quality. Meeting with new students to assist in the preparation for the financial aid process. Solidifying enrollments within one week of enrollment including follow-ups. Gathering and processing the loan documents for submission to 3rd party processor. Submitting professional judgments and dependency overrides to Regional or National Financial Aid Director(s). Maintaining and conducting the weekly audits of all student financial aid files. Maintaining all memberships at a state level along with local/regional training/updates from U.S Department of Education. Ensuring due diligence is performed at the campus for default prevention. Anticipating and resolving the problems that may delay disbursement of financial funding. Counseling students and parents on the various options regarding educational financing, including budgeting and resource planning. Summary : Senior Financial Aid Administrator with hands-on experience, knowledge, and training in diverse disciplines including Computer Information Systems, Contract Administration, Acquisition, Human Resources Administration, Operations Management, requirements generation and documentation, programming and budget execution. Exceptional skills demonstrated when working under high pressure. Responsible for meeting and counseling students and their families on the affordability of the school and their options for payment. Met with students when concerns were raised about financial aid. Successfully worked to alleviate anxiety and addressing the financial issues with students and family members. Reviewed Free Application for Federal Student Aid (FAFSA) applications and packaged award letters according to federal, state, and institutional guidelines. Assisted students in the FAFSA process including their FSA ID (financial student aid identification). Created outreach documents to make students aware of their financial aid responsibilities, created wallet cards to assist students in remembering their FAFSA login. Improved liaison with various departments to ensure that a student’s file was complete. Worked with admissions to facilitate the admissions process by making sure a student’s file was complete. Worked with a cohort of continuing students to ensure their files were complete and clean and verified. 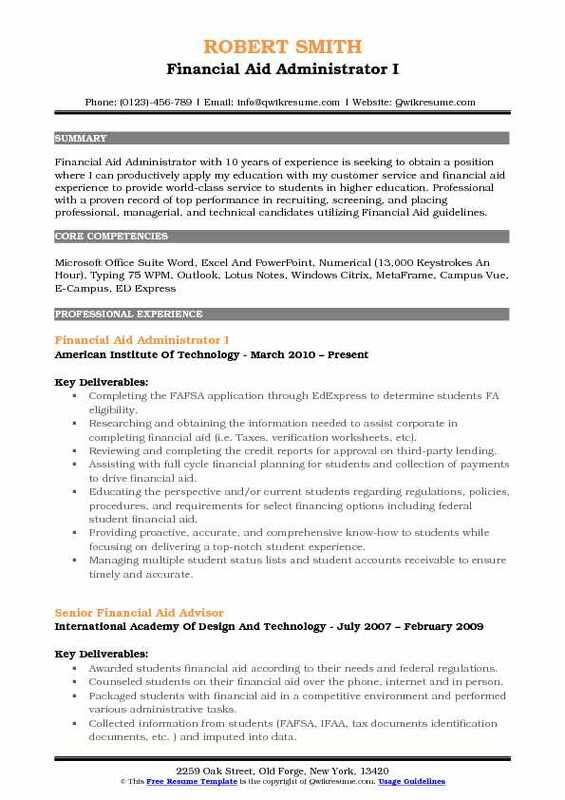 Summary : Dedicated Sr. Financial Aid Administrator with 8 years of experience in various settings and departments. Wide range of knowledge from front-end to back-end financial aid. Posses a well diverse culture background allowing me to work well and counsel all walks of life, delivering outstanding service to prospective students and their parents. Self-motivated professional highly proficient in developing creative solutions and implementing objective decision making. Working cohesively with the Admissions Department, Executive Director and Director of Education. Assisting the students and parents with financial aid application process (i.e. FAFSA, entrance counseling quiz and master promissory note). Communicating compliance requirements effectively to students and the other staff appropriately. Completing the verification process collecting any and all documents from the student that are needed. Submitting all completed files to the in-house processing department to be approved, certified and paid. Pulling reports in Campusvue, then converting to Excel to keep track of all current and past due Title IV disbursements. Increased the on-time disbursement percentage by 85% during the first 3 months of employment. Working closely with the Registrar/Bursar to ensure all payments, schedules and transfer credits are up-to-date in the system. Assisting the Bursar department in collecting the cash payments from the students each month, posting all payments. Training and assigning the time-sensitive tasks to employees and managing their work. 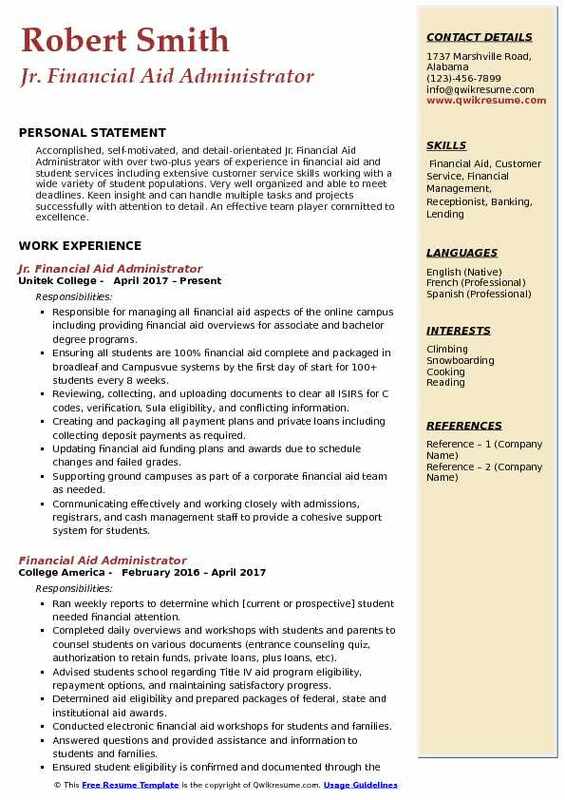 Objective : Financial Aid Administrator/Coordinator with 4 plus years of experience and a goal to provide excellent counseling to prospective students and their families in the entire financial aid process so they are well informed and able to make sound decisions with regard to their options. Responsibilities included an assurance that financial aid files are in compliance with federal regulations, accrediting standards, and company policies. Counseled and advised students and parents regarding financial aid eligibility, advised students on application procedures, aid programs and costs of attendance, follow up on student emails and voice mails. Performed audits of all financial aid files by examining certified Title IV funds, VA benefits, state-specific tuition grants, employer reimbursement and private loans. Applied to student accounts to assure compliance with company policies and federal regulations. Ensured all students attending are properly evaluated for eligibility and received all funds allowed through the Title IV federal financial aid program. Conducted entrance and exit interviews, providing students with the important loan. Communicated and interacted effectively with students, other departments on campus, CFAO and others in order to expedite student financial aid. Complied with all state, department of education and accreditation regulations. 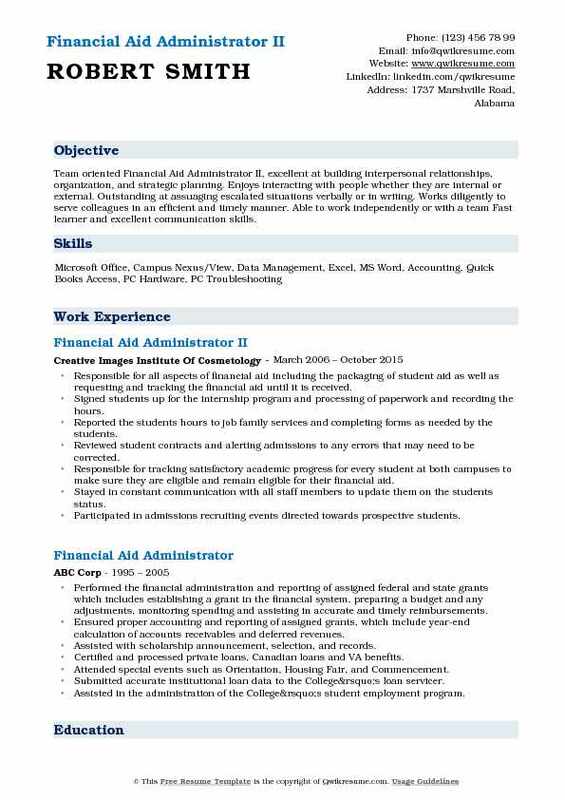 Headline : Responsive and student-focused Financial Aid Administrator with career success in recruiting and working with students to determine their best educational options - both financial and academic. Highly skilled in conducting entrance interviews, advising students, and administering work-study programs. Experienced in representing and promoting universities with the goal of increasing admission numbers. Extensive experience living abroad and bi-lingual. Served as an expert in financial aid compliance and regulatory issues. Applied accounting policies and procedures to students’ situations. Developed, implemented and revised policies and procedures to ensure compliance with federal and state laws, regulations and college policies related to financial aid and scholarships. Applied new methods, approaches, technology, and adapted methodology to new research. Executed cash flow analysis, successfully maintaining weekly schedule of reporting and accuracy balancing accounts. Maintained and updated various spreadsheets and schedules related to the calculation of the monthly net asset value of funds. Ensured that all policies, controls, and procedures were complied with in the process of preparing the financials and compilations. Analyzed, reviewed, and presented financial statements and reports using established guidelines and procedures. Assisted auditors for the purpose of providing supporting documentation and/or information or internal process that is required for audit. Managed federal default rate including development and implementation of effective borrower communications and default management tools. Summary : Team oriented Financial Aid Administrator II, excellent at building interpersonal relationships, organization, and strategic planning. Enjoys interacting with people whether they are internal or external. Outstanding at assuaging escalated situations verbally or in writing. Works diligently to serve colleagues in an efficient and timely manner. Able to work independently or with a team Fast learner and excellent communication skills. 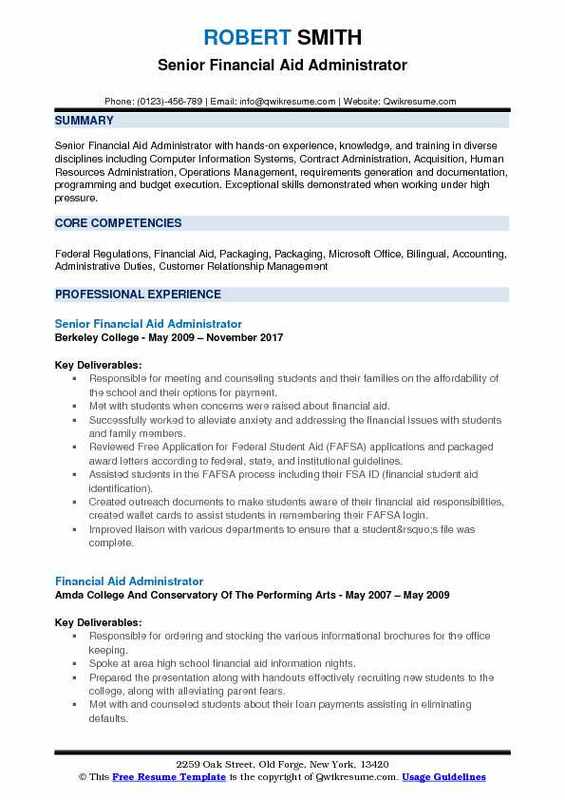 Responsible for all aspects of financial aid including the packaging of student aid as well as requesting and tracking the financial aid until it is received. Signed students up for the internship program and processing of paperwork and recording the hours. Reported the students hours to job family services and completing forms as needed by the students. Reviewed student contracts and alerting admissions to any errors that may need to be corrected. Responsible for tracking satisfactory academic progress for every student at both campuses to make sure they are eligible and remain eligible for their financial aid. Stayed in constant communication with all staff members to update them on the students status. Participated in admissions recruiting events directed towards prospective students. Supervised the financial aid call center staff that provides counseling services to customers who contact the office by phone. Summary : Excellent Financial Aid Administrator with over eight years of counseling experience desires Financial Aid Specialist position to utilize comprehensive writing, problem-solving, and communication skills in an atmosphere of support for students. Utilizes innovative techniques and solid management. Self-motivated and confident in making independent decisions. Proven record of applying analytical skills, problem-solving capabilities, and innovation to meet customer requirements. Analyzing and evaluating the financial viability of students and families, and providing financial aid counseling regarding all aspects of the financial aid process according to federal, state and institutional requirements. Conducting verification of student and parent financial aid application in compliance with federal criteria. Determining the student eligibility through the packaging process according to federal, state and institutional requirements. Participating in the development of institutional financial aid policies and procedures that will positively impact the efficiency and quality of the service provided. Participating in training and professional organizations to be informed of new information and program changes to be implemented. Reviewing for accuracy and providing signature approval/disapproval of loan applications and other financial documents. Providing information in person or via phone to students, prospective students, and families regarding financial aid, admissions, and student accounts. Summary : Financial Aid Administrator with 10 years of experience is seeking to obtain a position where I can productively apply my education with my customer service and financial aid experience to provide world-class service to students in higher education. Professional with a proven record of top performance in recruiting, screening, and placing professional, managerial, and technical candidates utilizing Financial Aid guidelines. Completing the FAFSA application through EdExpress to determine students FA eligibility. Researching and obtaining the information needed to assist corporate in completing financial aid (i.e. Taxes, verification worksheets, etc). Reviewing and completing the credit reports for approval on third-party lending. Assisting with full cycle financial planning for students and collection of payments to drive financial aid. Educating the perspective and/or current students regarding regulations, policies, procedures, and requirements for select financing options including federal student financial aid. Providing proactive, accurate, and comprehensive know-how to students while focusing on delivering a top-notch student experience. Managing multiple student status lists and student accounts receivable to ensure timely and accurate. Assisting the Director of finance with new and continuing student financial aid processes. Complying with Federal, VA, State, and Institutional compliance regulations. 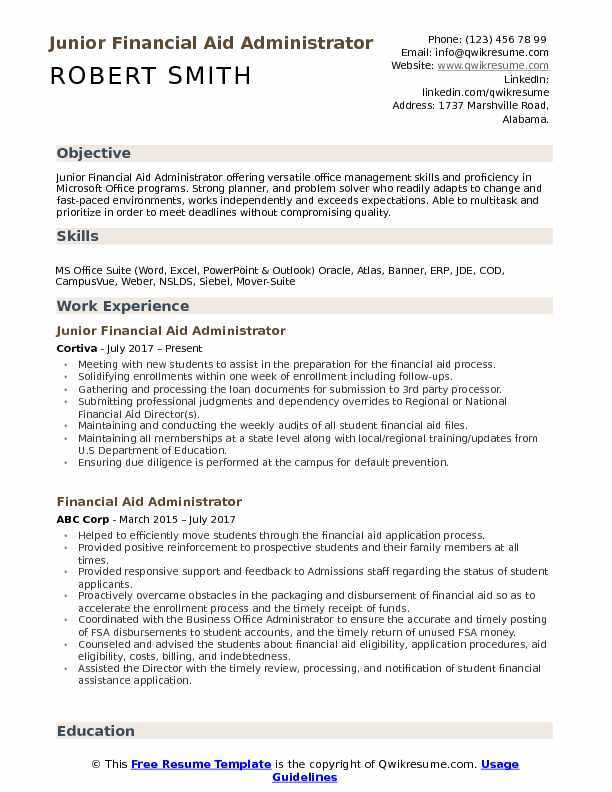 Objective : Accomplished, self-motivated, and detail-orientated Jr. Financial Aid Administrator with over two-plus years of experience in financial aid and student services including extensive customer service skills working with a wide variety of student populations. Very well organized and able to meet deadlines. Keen insight and can handle multiple tasks and projects successfully with attention to detail. An effective team player committed to excellence. Responsible for managing all financial aid aspects of the online campus including providing financial aid overviews for associate and bachelor degree programs. Ensuring all students are 100% financial aid complete and packaged in broadleaf and Campusvue systems by the first day of start for 100+ students every 8 weeks. Reviewing, collecting, and uploading documents to clear all ISIRS for C codes, verification, Sula eligibility, and conflicting information. Creating and packaging all payment plans and private loans including collecting deposit payments as required. Updating financial aid funding plans and awards due to schedule changes and failed grades. Supporting ground campuses as part of a corporate financial aid team as needed. Communicating effectively and working closely with admissions, registrars, and cash management staff to provide a cohesive support system for students. Advising the students and parents on outstanding balances, and if eligible for, a post-withdrawal disbursement. Counseling the students during the financial aid process and on how to handle overpayment situations. 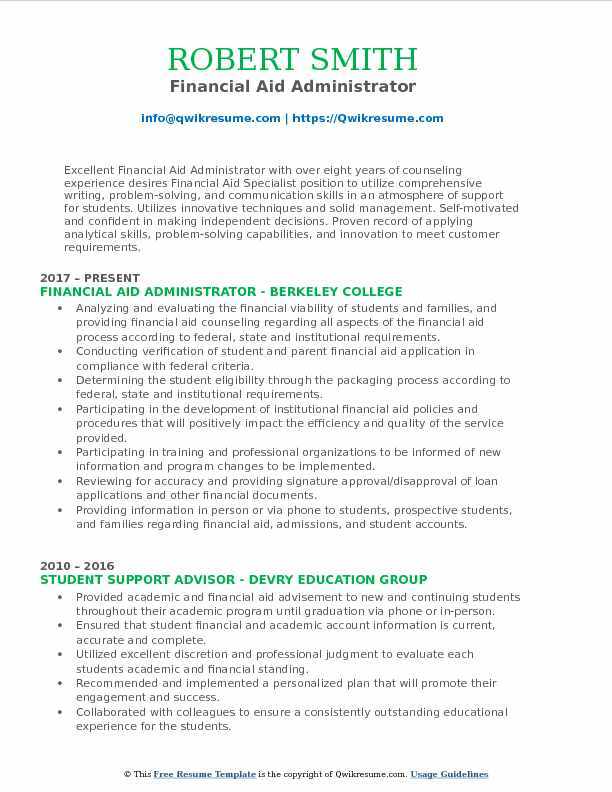 Objective : Dynamic, solutions-driven Financial Aid Professional with broad skills and notable accomplishments guiding students through all phases of the financial aid process. Consistently successful at delivering results and driving projects to completion through tenacity and clear-sighted focus on immediate goals and long-term objectives. Able to successfully coordinate and direct all phases of project-based efforts while managing, motivating, and leading project teams. 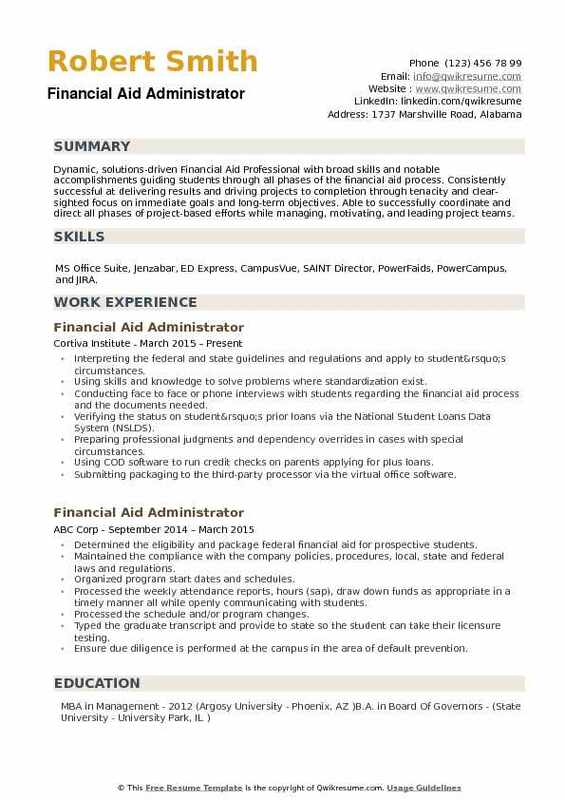 Skills : MS Office Suite, Jenzabar, ED Express, CampusVue, SAINT Director, PowerFaids, PowerCampus, and JIRA. Interpreting the federal and state guidelines and regulations and apply to student’s circumstances. Using skills and knowledge to solve problems where standardization exist. Conducting face to face or phone interviews with students regarding the financial aid process and the documents needed. Verifying the status on student’s prior loans via the National Student Loans Data System (NSLDS). Preparing professional judgments and dependency overrides in cases with special circumstances. Using COD software to run credit checks on parents applying for plus loans. Submitting packaging to the third-party processor via the virtual office software. Working collaboratively with the admissions team to enroll prospective students. Assisting the students with FAFSA process, following through on verifications, taxation documentation.